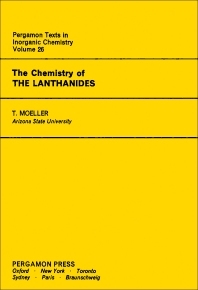 Inorganic Chemistry, Volume 26: The Chemistry of the Lanthanides provides information pertinent to the fundamental aspects of the chemistry of lanthanides. This book discusses the electronic configurations and the consequences thereof of lanthanides. Organized into four chapters, this volume begins with an overview of the characterized state of oxidation of all the lanthanides both in solid compounds and in solutions in water and other solvents. This text then presents the data indicating an overall decrease from lanthanum to lutetium even though there is the expected increase in the sizes of atoms and derived terpositive ions in Group IIIA elements. Other chapters consider the differences between the lanthanide elements and the d-transition. This book discusses as well the types of lanthanide complexes. The final chapter deals with the estimated absolute abundances of the lanthanides in the cosmos as well as in the crust. This book is a valuable resource for inorganic chemists.